This report describes the Technion's activities in absorbing immigrant students, scientists, research engineers, the Centre for Pre-University Studies, special courses carried out by the S. Neaman Institute, the Division of Continuing Education and External Studies and the entrepreneurial projects already in progress. 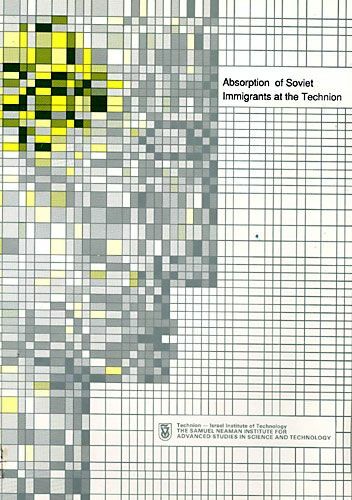 The report was prepared by the S. Neaman Institute, following its pioneering effort in presenting a plan for Technion's role in Immigrant Absorption (May 1990). It is based on interviews with Heads of Departments in charge of the different aspects of immigrant absorption at the Technion. The Technion views the Soviet immigration as an historic opportunity for the development of Israel, and considers the absorption of these immigrants as a top national priority. The great challenge of the 90s is to secure the successful absorption of Soviet immigrants alongside immigrants from other countries, Israeli army veterans, and Israelis returning home into Israeli society, into Israel's industry, science and economy. A significant proportion of the new immigrants from the Soviet Union are engineers, architects, scientists, physicians and students In engineering and sciences. Therefore, the Technion, as the major Israeli technological university, has a national focal role in the absorption process, in education, in retraining, in research and development, and in promoting entrepreneurial-job creation activities.